Hi! I hope this finds everyone safely tucked away from the storm hitting the east coast this weekend. Luckily, I’m far enough in-land here in CNY that I’m not being affected by it. Thank God! But I know many not too far off are getting a big dose of it. If you happen to be one, please stay safe! 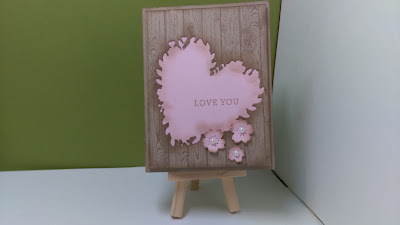 Anyway, I have a card here to share with you using the Bloomin’ Hearts Bundle. Here I used the negative of the die cut piece and I have saved the die cut for another day. I love the Hardwood stamp and decided to use that as well. I used both Crumb Cake cardstock and ink and I cut the flowers from Blushing Bride and used the Blushing Bride cardstock to back the die cut negative. I then sponged all of the pieces with the Crumb Cake ink and put it all together. So, what do you think? I would love to hear your comments so please feel free to post them below. Have a great day and I will see you again on Tuesday.